Looks better and better. I think you should make the game menu look like the battle menus for consistency purposes or maybe add a border to the game menu then make the battle menu a different color (eg blue with gray border). Also, inside houses you should add a row of wall tiles at the top like the ones in the middle with maybe some windows. Done, and done. Thanks for the suggestions! I also changed up the wood floor texture to make it look like a wood floor and added the code to give you exp and money if you win. I like the new name by the way. It's clearer what the game is about now I think. Also I like the house better. You could add some tables maybe. This is coming along nicely. Thanks so much! I have so much planned, and so much already done! Here's a new screenshot showing off leveling up, the items menu, and battle backgrounds! Awesome progress. I like the icons and when leveling up I like how you can increase one stat of your choice. You should make the battle background blue or gray like the sky. Thanks so much! I was actually thinking about that, and I'll have to try and see if it'll work. As per DJ's request, I have changed the battle background for the first area. I have done lots of other things, too. *Added NPC rendering and dialog. Currently only for the insides of houses but will be changed later. *(not in the screenshot) Added bosses, although not dialog and pun yet. *Adding more content like maps, NPCs, etc. It looks better and better and closer to an RPG more and more now. Also I like the new backgrounds in battles. NOw I got an idea, but I am unsure how hard it would be to implement, but would you be able to add gradients to the sky background using line and rectangles in xLIBC? That might be a problem for very large magic spells such as lightning or comet, though, if the animation spans through the screen. I'll try to post a mockup if I can. Basically, a gradient would be drawn, then lines on top of it, so the gradient would look like old NES and Atari games. It would be done through a For loop that increments by 1, 32 or 33 each iteration, depending of your choice (32 allows for lower gradient contrasts, thus, allowing dark rooms, while 33 allows some extra gradient choices, including one with lots of gray). I added extra gradient ideas in the mockup above to give you ideas. That increment setting could be set on dungeon loading in an extra list or variable element and if set to zero then no gradient would be applied. Make sure to backup before experimenting, though, in case. Looking good so far, it's kind of sad that you can't have nice animations on the CSE, would make the game more lively. Is it possible to change movement to be one or two pixels at a time ? Animations are actually possible by using some tricks such as switching back and forth between GRAM or drawing small stuff like lines. The screen also has hardware horizontal scrolling, 3 bits mode and inverting, which are instant. I think smooth character movement would be a nice plus on there. That gradient looks amazing I'll see if I can do that. It seems plausible but might add just a touch more loading time to initializing the battle screen. I think it'll definitely be worth it though. Unfortunately, movement can't be anything less than 8 pixel intervals. I tried 2 and 4, and both took a long time to move around. I haven't heard of 3 bits mode before, what exactly is it? 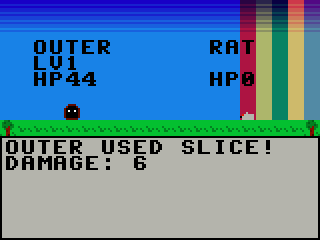 Also for powerful attacks (like endgame type of stuff), I think I'll have inverting colors. Also thanks to the mods for hooking me up with a sweet sub-forum! I don't think it deserved it's own 5 minute long .gif, but I started item management! So far, you can only view the item icons and names in the items menu. You can't see them in the battle menu, nor can you do stuff with them in either menu. No problem and for the 8 bits mode, I mean real(0,3,VALUE). Setting value to 1 will turn the screen into 8 colors mode (only cyan, magenta, blue, red, yellow, limegreen, black and white will be used). This can be handy for extra animations, but that mode doesn't work in emulators.